Strategies and habits I employ on a daily basis in the laboratory are also used to shape the way I cook, learn and improve my recipes. In my opinion, the most important skill is that of observation. Taking notes (mental or on paper) at every stage of an experiment allows you to go back later and determine where things went wrong, where things went right and how to achieve the desired outcome on your next attempt. When you are doing something new it is difficult to predict the outcome. It takes time to plan, research and execute a successful experiment. The same thing applies to cooking. Whenever I try a completely new recipe, I put a lot of effort into planning and looking at other recipes for tips. As with anything, the less experience you have the more difficult something might be. If your first attempt fails it does not mean you cannot do it, it just means you need to try again. If you properly noted how you did things the first time, you should also have a list of things you can do differently the next time. After awhile, after cooking many times and trying different recipes, you will start to accumulate a collection of techniques, skills and habits that can be applied and expanded to almost any combination of ingredients you can imagine. A prime example of this for me is the making of patties (or vegetable cakes, fritters or burgers). I have made many types of patties: some runny, some dry, some delicious, some disappointing, some simple, some difficult, some messy, some tidy, some cute and some ugly. Over my countless attempts at making different types of patties I have come up with the following simple rules that increase my chances of making a successful snack. First, baking is a great way to make patties. It takes longer but it frees up your time, allowing you to spend 20 or 30 minutes preparing other things, cleaning up your mess or just relaxing for a few minutes. As an added bonus, no extra oil is required for baking. Frying requires you to stand over the oven; you have to watch your patties, flip them, drain them and some will likely be cold by the time you are finished. Second, I am always looking for ways to remove eggs as a binder. I have a vegan sister and I like to find ways to make these recipes easily vegan friendly. By accident, I discovered that mashed potatoes are an amazing binder. The are sticky and moist. There is just nothing more perfect. Third, a combination of lemon juice, salt, garlic and fresh herbs adds just enough flavor to enhance any combination of grated or mashed vegetables. Flavourful cheeses like parmesan, sharp cheddar or goat cheese are great ingredients as well, if you are not vegan. Poaching eggs (see bottom of post) is another perfect example of a cooking technique that requires you to practice and observe what goes wrong or what goes right every time in order to improve. I made poached eggs at least 5 times where the end result was a disaster, before I figured out exactly what I was doing. I still mess up sometimes but every time I mess something up, I learn something new. Parsnips were my inspiration for these tasty little cakes. Parsnips are slightly sweet and offer a lot more flavor then regular old potatoes. 2 - Heat a small pot of water to low boil on stove. 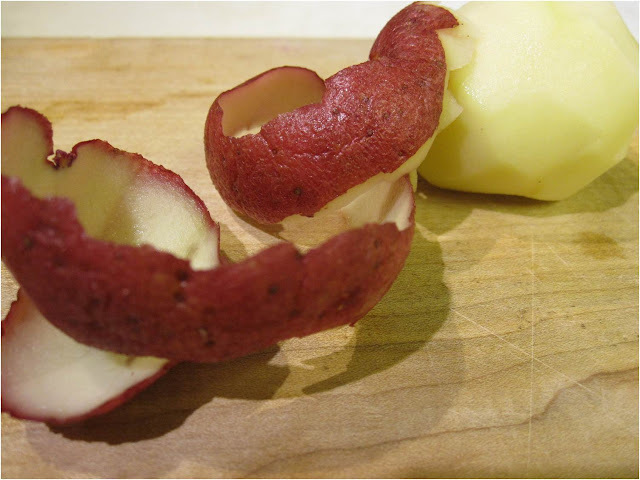 3 - Peel new potatoes (if you have red skinned potatoes and want your patties to be all white). 4 - Boil only 3 of the potatoes in the pot of water, until very tender, about 10 or 15 minutes. 5 - Meanwhile, using a cheese grater, grate raw parsnip, 2 of the raw new potatoes, and raw onion. 6 - In a bowl, mix the parsnip, grated potato, onion, garlic and white cheddar. 7 - Mix in olive oil, lemon juice and thyme. 8 - Drain boiled potatoes and mash with a fork. 9 - Stir mashed potatoes into grated vegetable mix. 10 - Line the tins of a muffin pan with squares of parchment paper. Cut a small slit on all 4 sides of the squares so they fit neatly into the muffin tins. 11 - Scoop mix into the muffin tins and press down with the bottom of a cup to flatten the cakes. 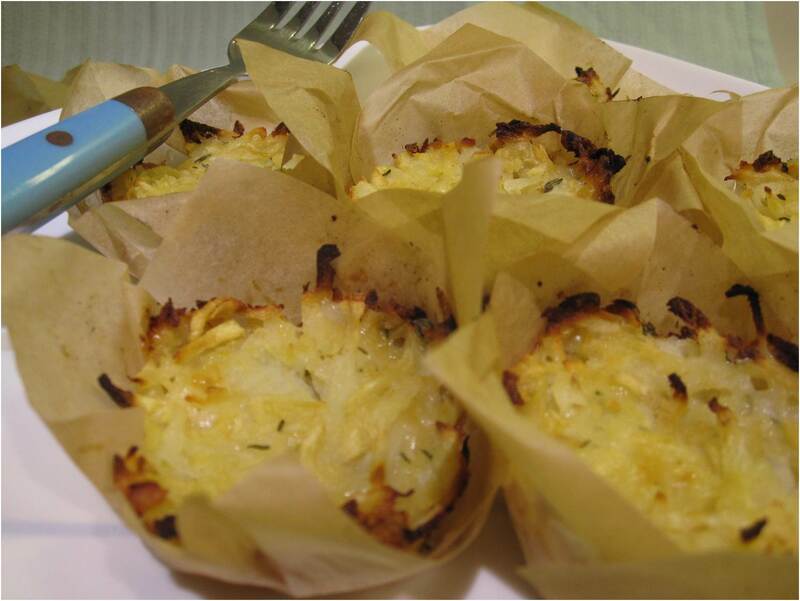 12 - Bake the hashbrown cakes for 25 - 30 minutes or until nicely browned. 13 - Meanwhile, poach, fry or scramble eggs. 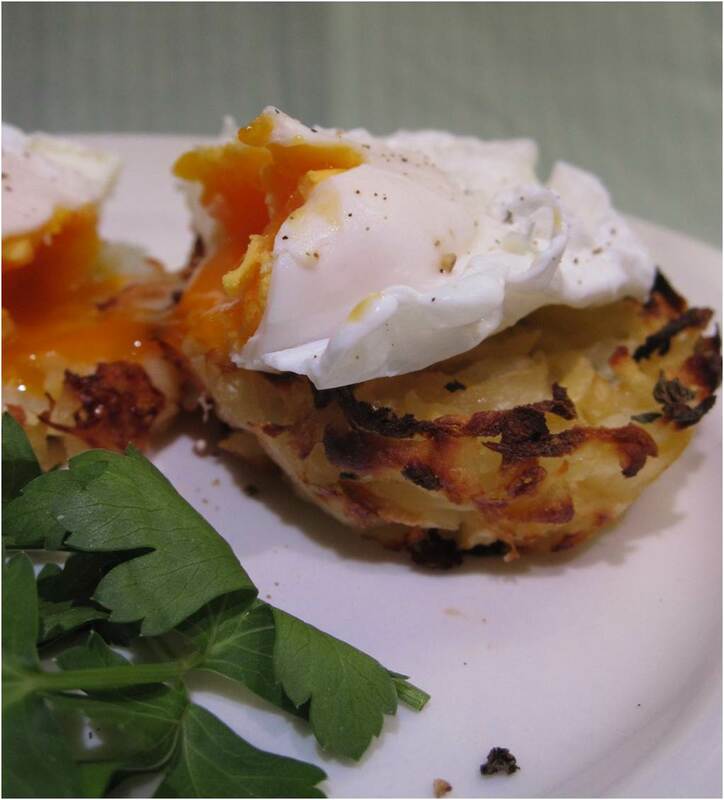 14 - Serve hashbrown cakes with eggs and enjoy! 1 - My newest tip on poaching eggs is to keep the water level in the pot low. The more water you have, the more room the egg whites have to disperse all over the place. As little as 1 and 1/2 inches deep is enough water for cooking a couple of eggs. 2 - Heat the water to boiling, add a splash of water to stop intense boiling and stir in a tbsp of white vinegar. It is important that the water is just on the brink of boiling (just gently bubbling) so that the eggs don't get tossed all over the place while they are still raw. 3 - Crack an egg into a small tea cup and gently lower the egg into the water. 4 - I like my eggs poached for 4 to 5 minutes because I don't like them super runny. Often, after 3 minutes I will use a slotted spatula to turn the egg upside down to make sure the top of the egg is cooked. 5 - I remove the eggs from the water with the slotted spatula and place the egg on a clean towel to drain. mmmmmm that looks delicious, I want now. Come over any time and I will make you some. 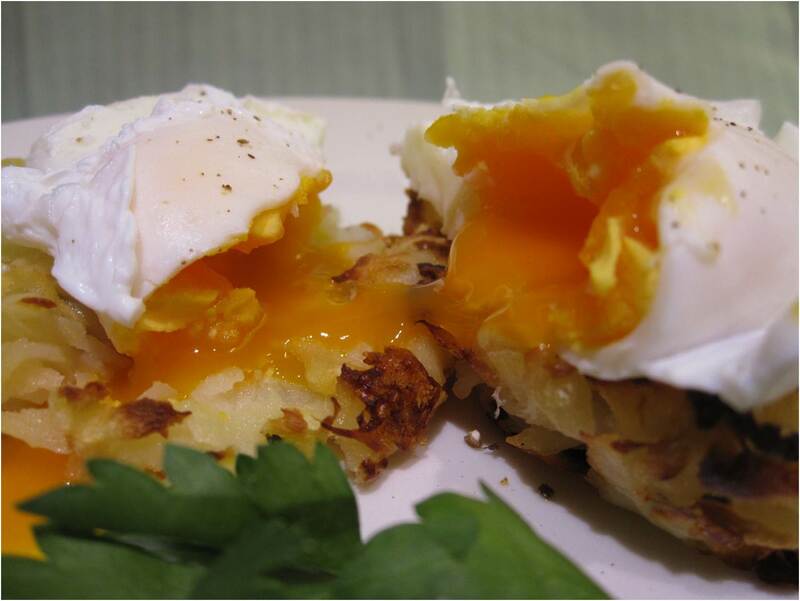 Made your parsnip hashbrowns today! Added zucchini and jalapeno-came out amazing!